Written and directed by Brian De Palma, Blow Out is the story of a sound effects technician who discovers he had recorded a murder after seeing a car crash into a creek. Inspired by Michaelangelo Antonioni’s Blow-Up, the film is an exploration into a man trying to uncover something that could be drastic as he finds himself getting more than he bargains for. Starring John Travolta, Nancy Allen, Dennis Franz, and John Lithgow. Blow Out is a stylish yet entrancing film from Brian De Palma. When a sound effects technician is at creek recording some sound for sound effects, he witnesses a car crashing into the lake as he saves a woman was in the car where he realizes that this wasn’t an accident. It’s a film that isn’t just about sight and sound but also what this sound technician would uncover as the victim who was killed in the crash is a presidential candidate as questions come into play. At the same time, the sound technician Jack Terry (John Travolta) realizes that there’s a cover up as there are those who want to say it’s an accident as he doesn’t think so while he believes he and the young woman he saved in Sally (Nancy Allen) are targets in this cover-up. 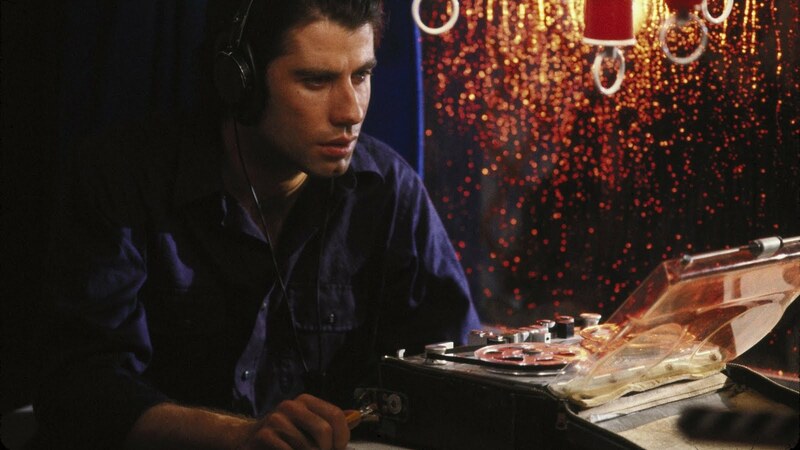 Brian De Palma’s screenplay explores Jack’s obsession with what he heard as he think what he hears at first is a tire blow-out but through the tape he’s listening to. He realizes that it was a gunshot that hit a tire as he knows something isn’t right as he asks what Sally was in the car for. Once the story progresses as Jack is trying to see what is going on as he becomes aware of a cover-up. Things start to unravel more as it relates to Sally’s involvement as well as the man who took the pictures of the chase in Manny Karp (Dennis Franz) who using the photos so he can get some big money. Another person that is involved in these events is a mysterious man named Burke (John Lithgow) as it is clear he’s involved in these cover-ups as he helps drive the story as well as Jack’s own investigation where Jack knows he can only rely on himself and Sally since he doesn’t trust the police due to a bad experience working as a surveillance man for them. De Palma’s direction is very ravishing for the way he presents the film as it begins as a creepy slasher film where it’s really a film within a film as it establishes what kind of work Jack does. It is De Palma sort of making fun of the world of horror including himself as it showcases how the slasher genre was becoming parody while it would also lead to some key moments into what Jack’s boss wants. Shot on location in Philadelphia, the film does play into this event as it relates to the anniversary of the Liberty Bell as it adds to this sense of suspense and paranoia that looks over Jack as he would try to do the right thing as well as turn to the police but things become complicated. De Palma’s approach to compositions from the way would shoot things in the foreground and the background add to the drama as well as the use of split-screens. The direction also has De Palma create some unique ideas of framing in the way he creates the element of mystery from the usage of high angles and other stylistic shots as well as his usage of close-ups and medium shots. Even in scenes that involve Jack and Sally as they both talk about what is happening as there’s an attraction between the two yet both of them see the bigger picture of what is going on. Once it become clear that there are forces behind this cover-up, the film does get darker as it showcases what kind of power some have as it would play into this very thrilling climax. A climax that is very stylish but also has a sense of power into the way things are in the world and what Jack is being asked to do in his job. Overall, De Palma crafts a very smart and riveting film about a sound technician witnessing a murder through his eyes and ears. Cinematographer Vilmos Zsigmond does brilliant work with the film‘s very low-key yet stylish photography from some of the exterior scenes set at night to the naturalistic look of the city locations in the day as well as the film‘s climax as it‘s awash with lots of colors as the film also features additional photography from Laszlo Kovacs for the film‘s climax. Editor Paul Hirsch does amazing work with the editing with its usage of jump-cuts and other stylized cuts to play into the suspense and chilling elements of the film as well as the cheesier cuts in the film within the film. Production designer Paul Sylbert and set decorator Bruce Weintraub do nice work with the look of the home apartment of Manny as well as the home and workplace of Jack that showcases their different lifestyles. Costume designer Ann Roth does terrific work with the clothes that Sally wears to present her unique style as someone who becomes aware of the target she has on her back. Sound editor Dan Sable does excellent work with the sound with the sound is cut as well as the many textures in the sound effects and such as it‘s one of the film‘s highlights. The film’s music by Pino Donaggio is fantastic for its orchestral bombast with its lush string arrangements and themes that play into the drama and suspense with elements of piano and low-key percussions as it helps drive the film as it is another of the film’s technical highlights. The casting by Lyn Stalmaster is superb as it features some notable small performances from John Aquino as Detective McKay, John McMartin as the governor’s aide Lawrence Henry, John Hoffmeister as the governor who is running for president, Peter Boyden as Jack’s director Sam, and Curt May as the news reporter Frank Donahue. Dennis Franz is wonderful as Sally’s friend Manny who took the pictures of the crash as he realizes the kind of money would be astronomical unaware of the severity and lies he’s creating. John Lithgow is brilliant as Burke as a man who is hired to take care of things as he is good in creating chaos as well as spy on those whom he feels will unveil the truth. Nancy Allen is fantastic as Sally as a young woman who was part of a conspiracy as she is unaware of the involvement as she tries to deal with the situations and help Jack reveal the truth. Finally, there’s John Travolta in an incredible performance as Jack Terry as this sound man who discovered that he had recorded an assassination as he realizes the danger of what is happening. It’s a performance where Travolta is quite restrained but also filled with a determination and humility that is engaging as he also has these amazing scenes with Allen as this film showcases Travolta in one of his finest performances of his career. Blow Out is a phenomenal film from Brian De Palma that features a tremendous performance from John Travolta. Along with a great supporting cast, some amazing technical work, and Pino Donaggio’s mesmerizing score. It’s not just this smart and visually-stylish thriller but also an intriguing study into the world of conspiracy and what is seen and heard in an act of murder. In the end, Blow Out is an outstanding film from Brian De Palma. Blow Out and Body Double are my two favorite Brian de Palma films. Both in my top 100. I love how the stories unfold, and yes, visually-stylish, with beautiful scores. Of the films of De Palma that I've seen so far, this is my 2nd favorite film of his as I just think it's a very smart thriller that doesn't play by the rules. Plus, it is not afraid to be style over substance where it actually does something to help tell the story as it just indicates why De Palma is so lauded among other filmmakers. This might be my fave De Palma - it really is him firing on all cylinders and brilliantly fuses his trademarks style with a substantial screenplay. Has Travolta ever been better? I don't think so. And also the use of Philadelphia is very effective, esp. that chase down the streets of the downtown. Amazing. Makes a great double bill with Coppola's THE CONVERSATION. @J.D.-I don't think Travolta has gotten better with the exception of the run he had from Pulp Fiction to The Thin Red Line. I think a triple-bill with The Conversation and Blow-Up would be a cinematic event. I just saw this movie and wow. I seriously can't get it out of my head. Very much so. I reviewed it yesterday if you're interested in reading my thoughts. @vinnieh-I read it. You and I are pretty much on the same page with that film.